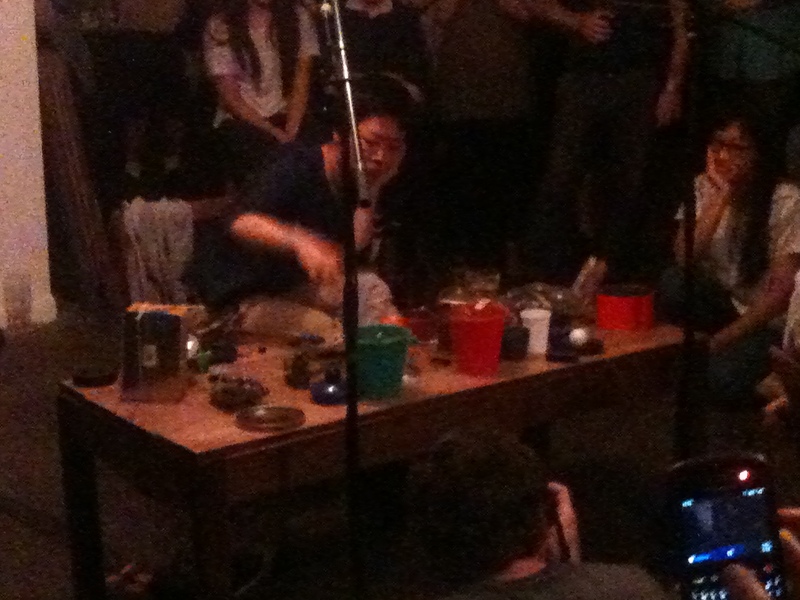 Café Oto, London, 22 August 2012, after 9.00pm: a warm night; the place is quite full. A low table, facing the stage area. Sometimes children lay out old and unwanted toys on the pavement, sit together and hope to sell a few things. This is what it looks like: plastic pails, cups, wires sprouting here and there, electrical scraps, unknown devices. Rie Nakajima sits with the quiet authority of a proprietor supervising her market stall. She activates without performance. We are rapt. Perpetual motion begins, a ticking; surfaces vibrate. Rhythmic cycles pass in and out of phase as if the watchmaker has drifted into reverie. But she is attentive, observing her children, keeping them out of trouble. She pours small materials, beads maybe, into a cup, upends it onto a vibrating plate, lifts a ping-pong ball from its pulsing surface, carefully upends another cup of small materials onto this same surface. Whatever is now hidden inside – these colourful plastic grains – dances in the dark. Time passes quickly, in fascination, perhaps because the room has become a complex clock mechanism, hushed and busy, its ticking moving in all directions as if time is a dismembered body, wandering away from itself. There is no such thing as ‘moving forward’; stop using that expression now, or then, or ever. Then she stops, looks up, smiles. This segment of time within an evening of music is marked by an ending. There is long applause (because we have all been drawn into the charm of small magic) but the machines continue for some time afterwards. Like insects, they have no interest in humans, their ideas of performance, the rules of engagement. Café Oto is a remarkable venue but one of its disadvantages is the lack of escape. Very few improvisers listen to sets by other people if they are preparing themselves to play. I’m not a virtuoso musician. I don’t practice for hours every day, nor do I play regular gigs. Everything I do is about questioning and instability. Hearing a brilliantly executed improvisation just before I play can be disastrous. Doubt creeps out of shadow places, insinuating itself into the field of potentiality. “Why can’t you play like this?”, Doubt asks me. “Why do you have to play so quietly, so loudly? Why are you not better at what you do?” I have no answer. Excitement is also a problem. Normally I don’t want to get excited about anything before playing. Derek Bailey once told me that he had turned age to his advantage. The promoter would assume he was exhausted from travelling or just from being alive for so long. “Please go and lie down,” the promoter would say and Derek would happily do so because it meant he didn’t have to engage in conversation with anybody and get distracted from the job in hand: to play. Yet I felt excited by this small magic – Rie’s section of the evening – and felt energised, ready to play almost immediately afterwards, free from the creeping questions of Doubt. This evil of Doubt can be unleashed by musicians whose fierce singularity of purpose crosses over into narrow dogmatism, as if their work is a weapon designed to eliminate all that is not them. As an artist Rie seems to possess that singularity but her composure and concentration turned out to be liberating, perhaps because the performance mixed strong self-determination with deliberate passivity. Others came to mind: Pierre Bastien, his Mecanium and trumpet (though Pierre is more of a Geppetto to his mechanical orchestra of Pinocchios); Max Eastley’s sonic automata (part sound installation, part artificial life); the small sounds of Rolf Julius (particularly his beautiful recording with Miki Yui) and Akio Suzuki’s way of casting a spell with the simplest of devices. I also though of kinetic sculptor Pol Bury, whose infinitely slow-moving microaudial sculptures bewitched me when I first saw them in the 1960s. Yet none of these precursors, if that is how they should be described, feels entirely appropriate; perhaps my closest experience of something similar was a Chiang Mai market stall stocked entirely with electronic bird sounds, all of them playing simultaneously to their owner, a woman whose job it was to be immersed in a perpetual dawn chorus of digital birdsong. This week I was asked a few questions for a newspaper interview. One of them wanted to know if making music outside formal concert environments was a good idea. My honest answer to that (though not exactly the one I gave) is that you could pick up all the world’s concert halls and dump them in the sea. I no longer care very much about what happens in such places. I care about these moments of falling under a charm. This entry was posted in into the maelstrom, Uncategorized and tagged Cafe Oto, Rie Nakajima. Bookmark the permalink. Just wondering whether I enjoyed your piece more because I didn’t hear the performance…..
Keep bumping into Rie but didn’t realise she performed. Maybe that’s true, Steve. There’s a lot to be said for not hearing concerts but thinking about what they might have been like. Yes, I liked the switch of focus, the way the audience had to rethink itself. Loved Cafe Oto when I visited London. One of those places where the atmosphere is beautifully in tune with the performances. Pointed stuff about doubt.